* Heart Rate: 60-110 beats/min. * Respiratory Rate: 25-60 breaths/min. What Is A Galvayne's Groove? 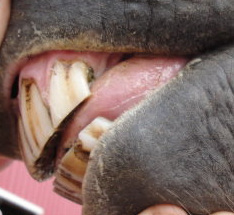 A Galvayne's groove is a dark or brownish groove in the upper corner incisor teeth of horses. It is only visible in horses of a certain age, and depending on whether or not it can be seen, how long it is, and where it is (at the top of the tooth or at the bottom) it may be helpful in determining a horses' age. Determining the age of a horse by its teeth must take into account a wide variety of factors, but even then there are many horses whose age cannot be accurately determined by their teeth. Simply put, while there are guidelines about how teeth should look in a horse at any given age, teeth sometimes lie. Environmental factors, diet, management practices, breed, individual variances, age (it is generally more accurate to age a horse younger than age 9 by its teeth than an older horse), and more can all cause a horse's teeth to inaccurately represent how old a horse actually is. When using teeth to try to determine the age of a horse older than 10 years, the Galvayne's groove is one of the indicators many horsemen will use. 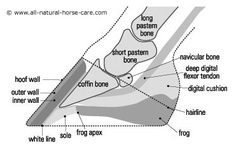 In the text and photos below we explain what a Galvayne's groove is, show several photos of Galvayne's grooves in different horses, and explain what it is expected (but not guaranteed) to look like when a horse is a certain age. 1) Discomfort while eating. The horse will drop a lot of feed while chewing, or turn his head to one side while chewing. Some horses may even become timid about eating, appearing to have less of an appetite. of nutrients for the horse making it unthrifty and unhealthy. 3) Avoidance of the bit, or head tossing. get teeth within a few weeks of life and by 9 months they have a full set of "deciduous" (temporary) teeth, numbering 24.
and yellowish in color. By the time a horse is six years old, he will have a full set permanent teeth. is beneficial in improving food utilization and therefore general health. of the lower teeth. This causes their teeth to wear down on one side of the upper jaw and the opposite side of the lower jaw. into the empty space left by the lost tooth. This can bind the jaw movement, making it very difficult for the horse to chew. sharp edge smooth using a number of tools called floats. tissues may cause tenderness in the mouth which could develop into resentment to the bit. Whenever there is a bit problem first check the condition of your horse's teeth. The most common tooth culprit is the wolf teeth. with the wolf teeth can be very painful to a horse. If your horse has wolf teeth a veterinarian can easily remove them. seen in older horses and are a prime cause of poor weight, poor coat and general lack of condition. But young horses can have dental problems as well. sharp edges can occur with the baby teeth at this early age and floating may be required. bit sits against them. If the wolf teeth are displaced or delayed in eruption, interference with the bit may also occur. they may shed a total of eight to twelve caps and four to six incisors (front teeth). If not shed late in their 3 year old year the caps from the third set of cheek teeth become ready for extraction. and floating (removal of sharp edges) is performed in this age group. ulcers or cuts from developing by ensuring a smooth contact between the cheeks or tongue against the first cheek teeth. digests food. Weight loss or colic may result if left untended. Strong, thick hoof walls - with the inner wall being thicker. Bars end approximately halfway down the frog. The heel buttresses are back towards the rear of the frog. 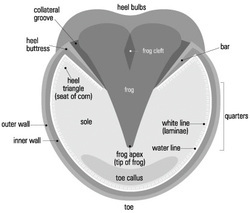 The hoof ratio is 65:35 (from the rear of the hoof to the widest point; and from the widest point to the break over). The rear hoof is more oblong in shape and has a slightly pointed toe compared to the front hoof. This is because the rear hooves are used to propel the horse forward and so the point helps the hoof dig into the ground to provide more push.